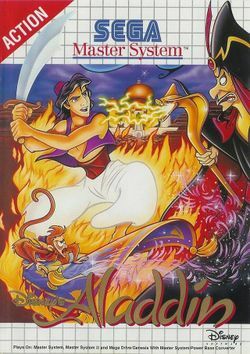 For the Genesis, NES, Amiga, DOS and GB game, see Disney's Aladdin. For the SNES and GBA version, see Disney's Aladdin (Capcom). Disney's Aladdin is a 1994 platform game by Sega. It follows the film's plot closely, separating the playable scenes with subtitled cutscenes portraying a simplified version of the film's script. The game plays very similarly to Prince of Persia, although the puzzles are not as difficult. This stage is very straightforward. For the entirety of this portion you are being pursued by a guard, and both Aladdin and the screen scrolling are constantly in motion. Jump over obstacles and collect any food items you see. As well as rolling barrels, pots will occasionally fall from the sky. If you hit an obstacle you take damage, and if you fall into a hole or get hit by the guard you have to start over. Next you will see a cutscene where Aladdin meets Princess Jasmine, then has to escape with her across the rooftops. This is much the same as the first part, but there are more holes than before. After a very short while you will see a cutscene and end up at the Cave of Wonders. You now have full control over your movement. From this point the game plays very much like Prince of Persia, and many of the same tricks apply here. Head to the right and watch out for the waterspout. Climb up onto the higher platform (the drops of water don't hurt, so don't worry about them) and make your way to the right. When you reach the end of the raised platforms drop straight down and a boulder will fall just in front of you. Head slowly forwards and another will fall as well as one rolling slowly towards you (just jump over it). After this comes another rolling boulder, followed by another falling boulder. Head down the stairs (using diagonals, ) to the next area. Grab the apple (if you are hurt). From the raised platform jump onto the platform to the left and then quickly to the left again (the platform will fall if you delay too long). Immediately duck and a bat will fly overhead. Head slowly to the right and duck for a second bat. Dash towards the left and push to slide under the low barrier (watch for yet another falling boulder) then go down the stairs (using diagonal movement as before). Jump across to the white platform, then across again. Drop down to the area with the spikes and crouch ( ) to make the spikes retract. While crouching, use to sneak forwards. Do the same with the second set of spikes. Step on the panel on the ground and return to the left in the same manner. This time climb onto the upper path and head to the right. Ignore the bread (it is utterly impossible to collect it without dying) and continue to the right, grabbing the scarab on the way. Take the lower path and make your way to the far right to find a key. Now return to the left and climb the stairs. Head to the right, avoiding a bat, a boulder, and a waterspout on the way. Climb onto the upper level and grab the rock ( ). Throw it into the mouth directly to the right ( ) and continue down the stairs. Make your way to the left, dodging bats and waterspouts, and go down the stairs. Navigate through the dangers here and go towards the door to the right (it only opens if you collected the key earlier in the cave). This is an easy stage. The only thing to worry about on this stage is the treasure: it may look nice, but if you touch any of it you die (as Aladdin was told in the film, "touch nothing but the lamp!"). You can't even hit it with your heels, so you may need to use running jumps to get over each treasure safely. After the second treasure chest the stage is complete. After this you see a short cutscene introducing you to the magic carpet, and showing what happens when you breach the cave's restriction. This is a challenging stage. You need to avoid dangers while collecting food to heal the damage you will inevitably take. If you hit the walls or rock outcroppings you die immediately, whereas if you hit anything else you only take damage. There are lots of food items so you should get through this stage without too much difficulty. You now see a long sequence of cutscenes progressing the plot as far as Aladdin discovering the lamp's powers, escaping the cave, and using his first wish to become prince Ali so he can try his luck at marrying Princess Jasmine. You will spend the rest of the game in your princely garb. Head to the right. A guard will spawn behind you and give chase. Once you draw near to the hole the guard will give up his pursuit. Jump over the hole and grab the key, then mantle onto the platform and go up the stairs. Grab the rock and continue to the right. Climb up, stun the guard, and head to the left. There is a staircase beyond the pit but it only leads to some rocks, so ignore it and continue to the left and up the staircase. Grab the key from the upper level and head to the right. The chandelier will drop from above when you draw near, so watch out for it. Head up the stairs. Go past more chandeliers and climb the ledge (there is an apple just below it if you are injured). Go down the stairs. Grab the scarab. Wait at one edge of the platform until the guard is at the other, then stun him with a rock and head down the stairs. Grab the rock and continue to the right, then go down the stairs. There is an apple just below here if you are injured. Make your way to the left, stunning or avoiding the guard, and throw a rock into the mouth on the wall to open the door. Grab the key to the far left, then go up the stairs. Open the door with the key, then jump across the pit for another key. Go to the far right and through the door, then grab the scarab. Push in towards the wall and the guard will rush towards you, triggering the plate that opens the door, then continue to the right. Climb onto the first platform you come to, then go up the stairs. Head to the far left and stun the guard, then grab the key (ignore the rock, you can easily get another). Return back to the right and down the stairs, then continue to the right. Cross the pit and go up the stairs. Climb up and go to the left, stunning the guard on your way (the panel on the floor opens the door to the bread just below). Continue to the left and go up the stairs. Continue to the right and use the rock on the mouth to open the door. Continue to the far right, and this stage is complete. A cutscene will progress the plot further. This stage is much the same as the previous carpet ride: collect food while avoiding obstacles. You will pass some fruit trees, but the food these drop will hurt you instead of healing you. When you pass the rooftops a second time the stage is complete. A cutscene now progresses the plot up to Jafar escaping. This is another simple chase stage. Rather than catching up with Jafar you simply have to follow him and avoid the various spells he uses. Eventually you will corner Jafar and he escapes. Notice the floating sword: go near to it (but not under it, or it will kill you) and it will drop. Grab it and start attacking Jafar (with ) while avoiding his attacks. Once you've hit him three times he'll turn into a giant snake. Now his attacks are more frequent and harder to dodge. You need to hit him with the sword while dodging fireballs. If you get too close his tail will push you away (without hurting you). Every time you hit him he draws away from you. After eight hits you will have driven him back towards the edge of the screen, then you will see the final cutscene. Enter AIQY as a password. You will flash constantly and not take any damage. Alternately, if you have a Pro Action Replay use the code 00C1+1606 for infinite energy (you will take damage but it will not deplete your health). This page was last edited on 14 February 2014, at 17:43.